Shift+ Z Doesn't work for me. So here's a video so you can see the process in action. I used Screencastify to create this on my Acer C720 Chromebook. What do we expect students to do with their device when they enter our classrooms? In a 1:1 environment, if this is not something every teacher can answer, then devices will be a distraction not a learning enhancement. When students are left to their own devices (literally), you have more chance they will be engaged in something other than the objectives of your lesson. I tell them them to "put that away, or close the lid"
We block YouTube in the school. They can't use their cameras or microphones to record lessons. It is against our 'Acceptable Use' guidelines. I give them large chunks of text or get them to record me for 10 minute blocks. Then in teams of three, they create mind maps, and shared notes to construct meaning from the information. They maintain their own blogs. They record the learning intentions at the start of every lesson then reflect on what they have learned. They find links to more information or add links to peer blogs. It's like their own diary. Share your practice on this editable Google Doc or leave a response below. "When students are left to their own devices (literally), you have more chance they will be engaged in something other than the objectives of your lesson." It's actually there...Double click on the PDF. Then Choose "Pop Out". I know +Chris Betcher (does the "+" work in Blogger?) was quite annoyed about losing the choice.... But here is an alternative way to look at it. In the old drive, it was critical to have the choice... Is it critical anymore? I don't think it is. Office files uploaded to drive default to being office files. Since they open natively in the browser and allows you to edit, the need to convert is no longer that important. Then if you want to collaborate with someone else, as soon as you press share, it converts it. Or if you want to convert, it's there under file. OK... You can google this and there are great instructions for using the Export/Improt functions. But here is a really simple way to transfer groups 1 at a time. 1. Open Outlook and get the group you want in the 'To:' as below. 2. Click the "+" so all the group members appear. 3. Drag your mouse over the email addresses that appear in the "To:" and copy these. 5. Create a new Contact Group and name it accordingly. 6. Click on "My Contacts" to find your new (but empty) group and double click to open the group. 7. Find the "Add users" icon, then paste all the email addresses from step 3 into the window that appears. Problem: When I am on a Website and click on an email link, it opens Outlook. How do I make Gmail the default mail client? Answer: When you are in Gmail, you get prompted as in the images below. You may also want to make Chrome your default browser. Google this to find out how. Our Student Support Services team just went Google on Friday. They were previously on Exchange/Outlook. One of the pain points was dealing with multiple accounts. Many have Google accounts in their school domains and one in tsv.catholic.edu.au. 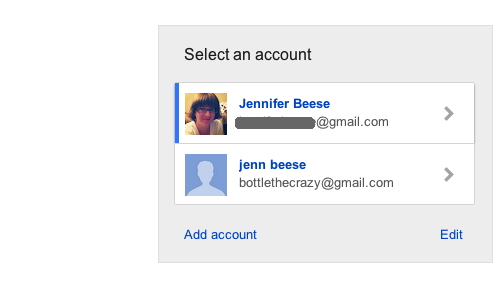 Here are three ways to manage multiple accounts. A neat workaround if you want to add editable tables in Google docs containing merged cells. Make the table in Word or Excel, Sheets or Presentations. Do your merging. Then copy the table. In Google docs, go to Insert, Drawing. (I bet you wondered why Google had this feature that forces you to create a drawing on the fly... Here is why.) When you paste your table into the Drawing window, then click "Save and Close", the merged table is embedded in your Google Doc as though it was created within the doc. But what is really neat is that anyone with edit rights on the doc can double click and edit the contents of the table. How many times have I done this.... I am in the middle of composing an email in Gmail and I accidentally delete a whole section of my message.... Gmail does not have an undo button.... So I grit my teeth and retype. But you can undo in Gmail. Ctrl+Z will undo in Gmail. Actually, it will undo in most things. I get so used to using the features in modern applications that I forget the old keyboard shortcuts. Learning Intentions vs Prediction? Are they mutually exclusive? I was inspired today by a session on student engagement delivered by +Mike Reading . Here is one takeaway from the experience and one question it raised for me. Perhaps get students to commit their predictions to a shared Google Doc. Does this contradict the notion of stating the learning intentions up front? If you don't know about Learning Intentions, this may help..